There are right and wrong ways to seek a new ministry if you believe that God is leading you to a new place of service. This article is mostly written for someone who serves on church staff under the direction of a pastor. Seek with pastoral approval and loyalty. Know the heart and preference of your pastor. You may have a pastor that would like all contacts about asking you to move to a new ministry to go to him first. Please refer anyone that is interested in hiring you to contact him and then if the door opens talk to them. Other pastors are more lenient and will not mind if you are approached and then come to him to talk about the new ministry possibility. As a church staff member you are an employee to the pastor or a person who has placed themselves under his leadership as an employee (when you might work in a church but have a secular job). Seek advice from your pastor, his experience, and leadership. It does not mean that you will necessarily always do what he may suggest, but it does allow you to hear his advice and thoughts on the matter. Keep the lines of communication open between you. Do not do things behind your pastor’s back. Your deeds should be in the light if you truly want to find a new ministry the right way. We heard a story one time about a man who went on “vacation” only a few miles away to candidate for a church in a neighboring community. This caused major problems between him and the pastor and the life of the church. 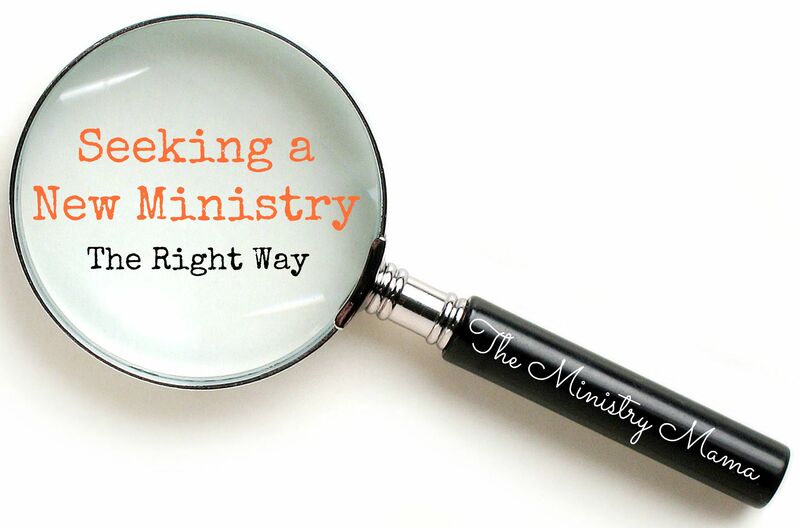 Seeking a new ministry in the right way means that you leave the church you are working in, in a right way. Increase your personal Bible reading and prayer time. You’ve heard the saying “A man is only as good as his word,” let’s change it up a little and say, “A man is only as good as he is reading God’s Word.” You can expect the Lord to clearly guide you if you are reading God’s Word and spending time in prayer. Attend church services and listen to preaching regularly. If you are a person heavily involved in ministry there may not be a lot of services that you actually attend where you are truly sitting and listening to the preaching of God’s Word. If you believe that God is leading you to a new ministry, this is the best time to stop and make it a priority to be in the church services to hear the Word. If this is not a possibility listen to sermons in your free time while you are riding in the car, when you are working on projects, or when it is convenient for you. The preaching and teaching of the Word of God will provide the power needed to guide you into the things He is leading you to do next. Pray together as a family. Making the matter of moving to a new ministry a matter of prayer with your family. When the Lord leads you to the next place it will make it an answered family prayer. This allows children to see God leading the family as a whole, not just their parents. When you include your children in the process it gives them security in knowing that they can follow the Lord in faith even though they may not understand why God is leading you away from a place they may already love and cherish. Just like your pastor does not want to be left in the dark, your family does not either. Get your name out there. “God will bring you to the place you are supposed to be through the people who you know,” a friend of ours told us. The family of God has all types of connections and one of them will potentially be what brings you to your next place of service. Not every person believes in this because they believe God will direct you solely without the help and guide of others. If you make this choice, keep praying and seeking God’s face and He will bring you an answer in His way and timing. Lord willing, the next article will be about Getting Your Name Out There the Right Way. This will give you some ideas that will help you do just that and do it in a right way. I write this mainly from what we have learned in our recent experiences of my husband stepping out by faith and following God’s call on his life to preach. This subject has been on our hearts and minds for the past few months as we have also had to face these situations as we wait for God’s leading. This article can help you to understand how to do this in a right way with your husband. Your main responsibility as a wife is to support your husband and to follow his leadership, and the best way that you can do that is by helping him do the things mentioned in this article. YOU can play a pivotal role of support by, allowing the Lord to work through your husband’s leadership to guide your family to your next place of service. This should be a matter of prayer between you two alone as much as it is as a family collectively, so that you might be able to have unity between each other and peace when the time comes to move. Please keep your heart and your mind pure to staying in God’s timing instead of deciding to orchestrate plans of your own – we saw how that worked with Sarai and her servant Hagar in Genesis, so be wise and wait on both your husband and your Lord. There is a place of service for you, designed for the both of you to serve together, just wait! You may be interested in the first article in this series: How to Tell When God is Moving You to a New Ministry.